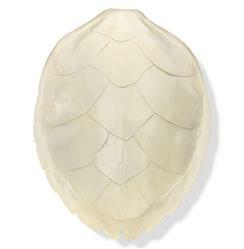 In the hands of skilled artists, the shell of an ivory hawksbill turtle is recreated perfectly. Each piece is a unique piece of art, a perfect addition to a zoological or botanical collection wall, or as a distinct piece of organic style art in any space. This item is made to order, please allow up to 3 weeks for production.